It’s been nearly three weeks since the RV we’re buying made it to Douglasville, and almost five weeks since the day we looked at it and signed the agreement to buy it. I guess I expected things would happen a lot faster – kind of like buying a car. I mean, it does have a motor, right? I did know before looking at the RV that even if we decided to buy it on the spot we wouldn’t drive it home the day we saw it. Besides the fact that neither of us had ever driven a ginormous RV, we planned to have it professionally inspected. Getting it to an inspector – or an inspector to it – would require time and logistical coordination. Why bother with the expense & hassle of an inspection? RVs have the complex systems of a house packed into a rolling box atop a big diesel (in our case) engine and drivetrain, plus some things you wouldn’t normally deal with in the course of owning a house or a car (leveling jacks, slides, black water tank). Brian’s smart and pretty handy, but all his RV knowledge to date is theory. Me? I did change an alternator once, but that was in the very, very dark days of life and done only under duress and with a great deal of swearing. RV mechanicals? Don’t even. We agreed months ago when we started RV shopping that, with this big a decision, it’s a lot smarter to pay $600 for the scrutiny and wisdom of people who live and breathe actual RVs on a daily basis than to cheap out and hope for the best on a $50,000 deal. The RV we have an agreement to buy is a 2003 Newmar Dutch Star. Newmar has an excellent reputation for quality and workmanship, and the Dutch Star looked well maintained. Even conscientious RV owners will miss some things, though, so despite its solid reputation and cared-for appearance, we wanted a professional set of eyes to go over all 41+ feet of it. Fortunately for us, Douglasville is home to Integrity RV Service Center, one of the best-regarded RV shops for miles around. In the three or so years Gordon, the seller, has owned the Dutch Star, Integrity has performed most of its maintenance. Gordon planned to have them take care of a few things broken under his watch, plus anything that would be covered under the warranty, before completing the sale. As soon as we agreed to the terms of the sale, Gordon phoned Integrity to ask about bringing the Dutch Star in. Unfortunately, it would be another two weeks before they could get the coach on their schedule. 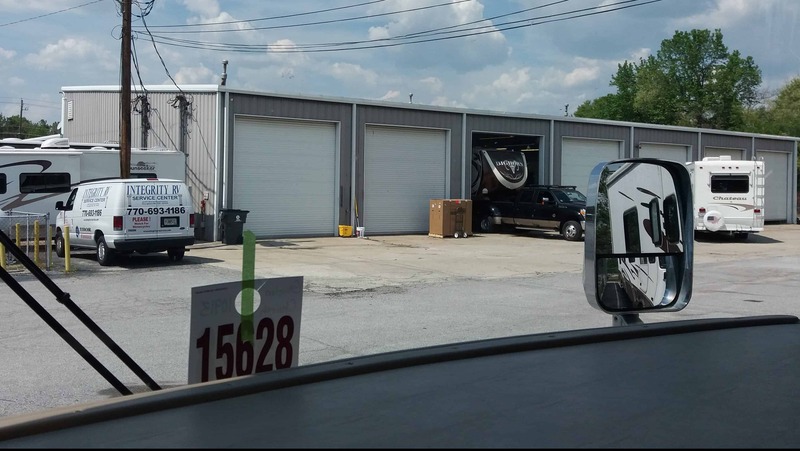 Like many RV service centers, Integrity’s service bays were booked solid. From what I’ve read of others’ experience, most RV shops are usually booked even further out – more so as you get into a travel season that includes far more people than just the full-time RV crowd. About three weeks ago I stopped by Integrity to ask about an inspection. I spoke with the owner, Dean, who told me it was a solid coach but that getting it inspected was a smart thing to do. Dean then told me they’d have to work the inspection in, and it would most likely be the following week before they could get to it. Further delay disappointed me, but we were not doing the deal without the inspection. The results of our RV’s pre-purchase inspection. A week later, the inspection report arrived in my inbox. As I opened it and scanned the list of “deficiencies” a sinking feeling grew in the pit of my stomach. There were some minor things on the list, but a few items seemed fairly significant to me. Definitely the tires were big money – like $2,500 – $3,000. Gordon told us the coach had new tires when he bought it. As much as we knew from all our reading that we should check the dates on the tires anyway, we forgot. We first met Gordon to look at the Dutch Star at a storage facility on the northeast side of Atlanta. A bright and beautiful early spring day, it would have made for perfect RV shopping weather if it hadn’t been so damn cold. Gordon walked Brian around the outside of the RV, going over features and flaws, while I ducked inside to check out the interior (where it was warm and cozy). Our interactions with Gordon had begun amicably enough. When it came time to talk money, though, Brian showed him the book values he’d obtained from David Lester (see How to Buy An RV Without Getting Screwed for info) and Gordon bristled. “I don’t have to sell this RV,” Gordon said. “And I’m sure as heck not going to give it away,” he added, visibly irritated. His words played back in my mind as I read through the inspection report. How could we deal with a seller who already thought an actual market price was too low, and negotiate a fair price given the problems found? Before we’d sealed the deal (I thought), I got the feeling that Gordon thought we were trying to take advantage of him. We don’t know what Gordon paid for the Dutch Star three years ago, but we do know he bought from a dealership. You won’t necessarily pay more at a dealer – but you will definitely pay more if you don’t question their pricing. The possibility that Gordon overpaid is something we could be sympathetic about. But we couldn’t overpay because he overpaid. In an instant we had a deal and I remembered to breathe again. Now, we faced going back to Gordon and telling him we wouldn’t complete the deal without concessions on his part. I say “we,” but it was Brian who contacted Gordon. The conversation with Gordon once again became contentious, and Brian’s frustration grew. I felt calm, but feared another round of RV shopping was in our very near future. Brian called Gordon from the shop in between taking care of customers. Brian relayed the gist of their conversation to me in text messages so I knew what was going on, but we needed to talk about this RV. He knew this, without a doubt. I think he just needed assurance that if we did have to walk we could deal with it. By the next evening, Brian had spent time with an Integrity tech going over the list of problems and getting his head around costs, what was actually a big deal, and what he could handle himself. The tech was familiar with our prospective RV, and told Brian that its deficiencies were small potatoes compared to similar coaches they see. Within another day or so Brian had a conversation with Gordon that went better than their previous talk. As it stands now we expect Gordon will knock a couple thousand off the selling price, and we’ll take care of a lot of things on our own. The RV is still at Integrity waiting on parts. Gordon is on vacation so no deal is going down this week. Is expert advice always worth the price? Brian and I obviously have the benefit of hindsight when weighing benefits vs. money spent with David Lester and on Integrity’s pre-purchase inspection, so the decision looks like a no-brainer. We certainly feel good now about spending $600 and saving thousands, at least. Even if we have to walk away from the Dutch Star deal, I couldn’t imagine not seeking and heeding expert advice with a decision like purchasing an RV for full-time living. After all, this RV will impact every area of our lives. Are we being too cautious? Have you ever paid for advice and had it end badly anyway? Or, if you’re willing to admit it, did you decide not to get an expert opinion and wind up regretting it? Please consider sharing your thoughts below. Any RVs, old or new , at some point will require repairs and maintenance. It’s unavoidable. When we were searching for our motorhome, we want to make sure ours has been kept up for major things like the truck-related items — engine, transmission. And for the house part, for absence of water damage, leaky roof or plumbing. Everything else in the RV is age-dependent and we’d have to budget for replace,net and repair, like new tires, repair of ACs, fridge, awnings. As long as the price of the motorhome is fair (i.e. close to fair market price) we are happy to pay a little bit less if the bone is solid. I thought the inspection report was a bit vague about the need for new tires for a 12/12 date. Are there signs of worn tires? I don’t think the tires have excessive wear for their age, but they were older than what we were told. In addition, they’re not a very good brand. I think they should be fine for us to make short trips, but we will want to replace them with something of better quality before doing longer trips or hitting the road for good. So, me again. Agree 100% — we always pay for inspections. First, because we nearly always shop via Internet (even for vehicles). Second, because a good inspector will generate enough ammo to get you out of a lemon contract. And, if the asset is in such great shape that no “out” is needed, it’s money well-spent for the reassurance. We’re currently closing a deal for an RV out of state. Even though the dealership is reputable and everyone there has been very very very nice, we’ve asked an NRVIA inspector to give the final OK.
Good for you, Serri. Even the best, most well-intentioned people miss things. in a couple days. Rationing the news, y’know, so my rabid public doesn’t burn out.